1) This paper has been prepared and presented at the 7th FIG Regional Conference in Hanoi, Vietnam, 19-22 October 2009. Nowadays the time of GPS or even GNSS static baseline determination is almost out-of-date for everyday applications. The present trends are to continuously observe and measure using GNSS, install permanent GNSS base stations or networks and provide real time accurate positioning. If you put these three trends together you have an advanced component of geoscience infrastructure known as a GNSS CORS network. These networks need to have a geodetic datum, meaning that they have to be linked to the available terrestrial reference frames. Such GNSS CORS networks are or will be the primary means by which numerous users can access and realize position that is based on a geodetic datum. In some regions, GNSS CORS networks are so well developed and dynamic that they have a more prominent role than the existing classical passive geodetic infrastructure in reference frame determination or monitoring. This paper will focus on the relationship of GNSS CORS with global and regional reference frames. It will provide procedures for realizing the link between the GNSS CORS and the available reference frames. An overview on the key aspects of a GNSS CORS site and CORS network will be articulated. Some information regarding the concepts of virtual reference station and of area-correction parameters as well as of the master-auxiliary-concept will also be discussed. In addition, this paper will outline the various positioning services that GNSS CORS networks could provide. One of the main trends in modern geosciences is the monitoring of the planet earth as a whole realized by the Global Earth Observing System (GEOSS) and, as a part of it, the Global Geodetic Observing System (GGOS). Apart from other topics its task is to maintain the stability of and to provide open access to the geometric and gravimetric reference frames as well as time series of data and products, by ensuring the generation of uninterrupted state-of-the-art global observation related to the three fundamental aspects of geodesy, namely geometry and kinematics, earth orientation and rotation, and the gravity field and its variability (IAG 2009). These monitoring tasks help to understand climate change, are usable to predict and monitor natural disasters, help to realise sustainable development and may lead to a global structural policy. One important module is the establishing, monitoring and making available of a global accurate and reliable reference frame. This is already realised by the International Reference Frame (ITRF) with its different realisations. This reference frame is non-active but is a near real time accessible geodetic datum. On the other side there is a strong world-wide need for positions in real time regarding positioning, navigation as well as guidance and control. These positions are needed for mass market applications like car navigation systems as well as geodetic applications like state survey, cadastral measurements or engineering surveys. This is a reason that some GNSS receivers are continuously operated as so called CORS (Continuously Operating Reference Stations) to allow the real time availability. Additionally CORS can be united into networks to reduce errors and to have the capability to deliver positioning services for a country, a state or even world-wide. In any case for high accurate applications especially in geoscience the connection to global terrestrial reference frames like ITRF is very important. Consequently, the authors of this paper will provide some basic procedures regarding the linking of CORS networks to reference frames and also an insight into the various positioning infrastructure and services that can emanate from such networks. From a spatial information perspective, it is common for spatial datasets and geographical information data to extend over national or regional boundaries and for the global surveyors or organisations across continents. In this situation it is needed to have a common reference frame for the collection, storage, visualisation and exchanging of the information. ITRF is the most accurate reference frame that exists internationally. 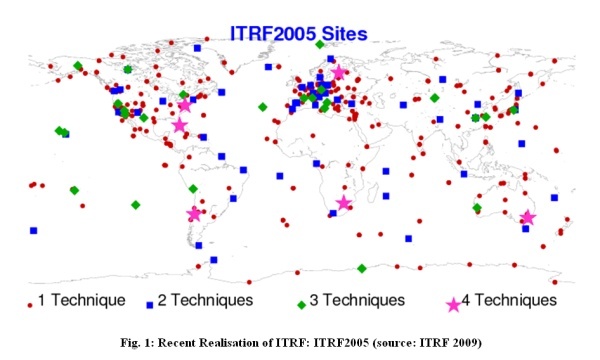 ITRF is defined by the International Earth Rotation and Reference System Service (IERS). The present trend is that more and more regions as well as countries are using a solution based on ITRF. DORIS (doppler orbitography and radio positioning integrated by satellite). These measurement techniques all have their strengths and weaknesses but the combination produces a strong terrestrial reference frame. This reference frame is determined from geodetic observations from globally distributed networks, however the solution could be improved if there were more spaced based geodetic observations in the southern hemisphere. Well defined parameters for a 7-parameter three-dimensional similarity transformation are used for transformation between the different ITRF realisations. The velocities valid in the respective reference frame have to be transformed as well. In literature this procedure is referred to as 14 parameter transformation. The procedure is described in IERS (2004) and the transformation parameters are given e.g. in ITRF (2009). A new solution, ITRF 2008, is expected to be released during 2009. ITRF coordinates or positions are articulated as three dimensional geocentric or Earth Centred Cartesian co-ordinates ie “X, Y and Z”. To convert these Cartesian coordinates to geographic respectively ellipsoidal coordinates (latitudes and longitudes and ellipsoidal height) the GRS80 ellipsoid is pre-dominantly used as it is the best fitting analytical model for the earth’s surface. However in some cases it is necessary to describe an ITRF position in plane (grid) co-ordinates (eg two dimensions – eastings and northings) hence a mathematical map projection is used. A popular map projection which retains the angle is the Universal Transverse Mercator (UTM) projection. Today it is common to determine a point’s position using Global Navigation Satellite Systems (GNSS). Positions are not absolute quantities. They are dependent on the reference frame to which they are referred. If GPS is used then the point’s position is determined in the reference system WGS 84. Observing in a good GNSS environment, the absolute accuracy for a single point position fix is ± 5 - 10 metres in the horizontal – ie 2 dimensions at the 2 sigma (2σ) confidence level. WGS84 or the World Geodetic System 1984 is the geodetic reference system used by the GNSS - “GPS”. It was developed for the United States Defence Mapping Agency (DMA), now called NGA (National Geospatial - Intelligence Agency). Although the name WGS84 has remained the same, it has been enhanced on several occasions to a point where it is now aligned on the cm-level to ITRF2000 at epoch 2001.0 and referenced as WGS 84 (G1150) referred to the GPS week no 1150 (NIMA 2006). The origin of the WGS84 framework is also the earth’s centre of mass. For other GNSS we can mention that Galileo will use ITRF as reference system whereby the others will consider aligning as close as possible to ITRF. According to ICSM (2009), the ellipsoid recommended by the International Association of Geodesy (IAG) is the Geodetic Reference System 1980 ellipsoid. This ellipsoid was used by the United States Defence Mapping Agency with WGS84. The parameters of the WGS84 ellipsoid “....are identical to those for the Geodetic Reference System 1980 (GRS80) ellipsoid with one minor exception. The form coefficient J2 used for the second degree zonal is that of the WGS84 Earth Gravitational Model rather than the notation J2 used with GRS80.” - DMA (1987). The end result is that the GRS80 and WGS84 ellipsoids have a very small difference in the inverse flattening, but this difference is insignificant for most practical applications. For all practical purposes, an ITRF based geodetic datum and WGS84 are the same for the epochs defined. The difference is below the cm-level for each coordinate. As a consequence it is very seldom that the reference frame for GNSS CORS (Continuously Operating Reference Station) networks is not based on ITRF. If mm to cm accuracy is required then GNSS phase data from points of known position in the region are needed. The resulting coordinates for the point to be determined will then be in the same reference frame as the point with given coordinates, the reference point. This local point could be a permanent GNSS station in continuously operating reference station (CORS) network that is linked to an International Terrestrial Reference Frame (ITRF). The same is valid for non-accurate code data solution on the 1 to 10 m level. Here the difference between WGS84 and any ITRF solution is without importance. Regarding the height system by using a GNSS CORS network the surveyor will normally derive a height based on the reference ellipsoid ie the GRS80. Most users however are working with physical heights based on a local height datum (ie local mean sea level) and thus need to relate the derived ellipsoid height to this local height datum. This is achieved by using a geoid model for the subject survey area or by determining a local geoid by interpolation. A more sophisticated approach is given by Jäger et al. (2003). The most known GNSS is the Global Positioning System (GPS) developed by the United States Department of Defence and is currently managed by the United States Air Force 50th Space Wing. Competing and complementary systems are GLONASS and in the future, among others, the European Galileo and the Chinese Compass. There are also other GNSS in operation or being developed such as the Japanese “QZSS” and the Indian Regional Navigational Satellite System “IRNSS”. For all GNSS measurements of geodetic accuracy you will need at least two simultaneously measuring receivers and the use of phase observations. In general, the one on a site with known coordinates is called the reference station (also known as the ‘master’ or ‘base’). The one located on the site with unknown coordinates is called the rover. This procedure is used for code observations as well. In this case the accuracy is somewhat worse around 0.5 m or even between 1 m and 3 m depending on the measuring technique (compare section 3.2). This determination of relative coordinates is called the DGPS-principle. Figure 2 presents the general idea behind it. The error influences that are the same or nearly the same at both sites are eliminated or at least strongly reduced. This covers all influences but multipath and measurement noise. The development of GNSS, especially of GPS, has lead to the operation of continuous operating reference stations (CORS) that acquire GPS signals without any interruption. Additionally these CORS have the task to store the data and in some circumstances process the data and then transmit this data to rover receivers. 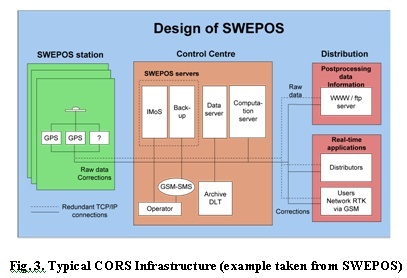 CORS help the users by economizing one GPS receiver as the operation of the reference station is performed by the service provider of the CORS network. Thereby networks using code or phase observation show different characteristics. Every CORS network consists of several GNSS stations interconnected by reliable communications to enable real time computations and control. Each station, as a minimum, requires a receiver (preferably geodetic quality), an antenna (affixed to a stable monument), communications and a power supply. In some cases a computer is installed additionally for data transmission and control, however modern day receivers, with suitable communications and network management software) now have the ability to stream raw data back to a central server location. In ideal cases a supplementary configuration is used for reliability or back up reasons (Refer to Figure 3). Additionally a user interface is required to configure and maintain the network. This may be realized remotely e.g. by radio communication or by digital communication (mobile phone network) or via internet connection. If we are talking about an offline network that provides the information to the user for post-processing, the stored data files use “receiver independent exchange format”, that is RINEX .. For online networks real time kinematic (RTK) is the application and the RTCM (Radio Technical Commission for Maritime Services) format is normally used for data transmission. The RTCM format is an internationally accepted standard format for real time data transmission of differential (RTK) GNSS corrections from GNSS CORS (including networks) to mobile GNSS receivers. Details of RTCM 3.0 can be found at: http://www.rtcm.org/overview.php#Standards. Tier 1 – ultra-high accuracy CORS networks equipped with geodetic quality receivers that can track all the broadcast GNSS/RNSS (regional navigation satellite systems) frequencies/signals, have a stable antenna monument, comply with the International GNSS Service (IGS) Site Guidelines, and are established for ultra-high accuracy networks to support geo-scientific research and global reference frame definition. Tier 1 contributes to the IGS. Tier 2 – are the high accuracy CORS networks equipped with geodetic quality receivers, that can track all the broadcast GNSS/RNSS frequencies/signals, have a stable antenna monument, and comply with the International GNSS Service (IGS) Site Guidelines. These networks are normally operated by National geodetic agencies or State governments for the purpose of maintaining national geodetic datums and providing the fundamental ‘backbone’ of a national geospatial reference frame. Tier 3 – are the CORS networks equipped with “minimum interoperable configuration design” receivers that can track the interoperable L1-L5 GNSS/RNSS frequencies / signals. These stations densify the National CORS networks, and are operated by agencies such as State governments, or private companies providing commercial differential GNSS (DGNSS) services. The services are generally for positioning applications; and real-time access to the datum and positioning services. The accuracy of these networks is nominally ‘fit for purpose’. The site and monumentation requirements for these CORS networks may not be as stringent as those for Tier 1or 2, however reliable and quality communication and power infrastructure is often necessary due to commercial obligations. CORS networks are established for numerous reasons however the accuracy of the end product, position, will vary as it is dependent on how it is dervied. 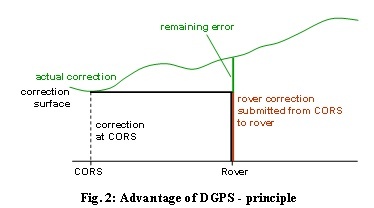 A distinction therefore has to be made between DGPS (differential GPS) using code observations and PDGPS (precise DGPS) using carrier phase observations. The DGPS networks provide a standard deviation of 1 to 3 m. In this case pseudo-range differences are used to correct the observations at the rover side. This princple works well for code observations and distances up to some 100 kms; so a sparse CORS network is adequate. An advanced variant is the use of carrier phases to smooth the code observations at the rover receiver. The standard deviation is better than 0.5 m. One example for this kind of network is the WADGPS (Wide Area DGPS) firstly established in the US and published by Kee (1996). Typical realisations are the American WAAS and the European EGNOS systems. Mostly the corrections are provided using the state-space appoach (e.g. Wübbena & Willgalis 2001) delivering modelled biases for the different error sources. The latter is the same approach that is used for PDGPS networks. Additionally all the measurement data of the reference station is transferred to the rover that provides the solution. Here the ambiguities of the carrier phase observations are solved and fixed to integer values; for long baselines or ionospherically disturbed measurements they can only be fixed to real values. In this case the GNSS-experts speak about float solutions. Using dense networks the accuracy reaches 1 to 2 cm standard deviation. The real time variant is called real time kinematic (RTK) although it is not really a kinematic application. In general the measurements are taken in static mode, but the technique may be used for kinematic data acquisition as well. Table 2 follows the abbreviation GPS instead of GNSS, since still most users unse GPS only, although the wording DGNSS and PGNSS would be more correct. Additionally users distinguish between post-processing and real time networks. The latter requiring a wirelesss connection to transfer the corrections generated at the references station network by the service provider. The first one may use email contacts, fixed network or moble phones for data transfer or even web-portals for data download via internet. In general a PDGPS service provider owns or operates a CORS GNSS res. GPS network that is capable of estimating or resolving the ambiguities of all CORS as one homogeneous model in post-processing or in real time. This is often referred to as a network solution within a GNSS CORS network. The most important error source of these is the ionospheric one. The site-dependent errors like multipath, antenna phase centre variations and measurement noise are not reduced by the network approach. Figure 4 shows the improvement by a network solution in a simplified way for the two-dimensional case (two CORS). The two main advantages of GNSS CORS networks are the reduction of baseline dependent errors and the automatic referencing of the GNSS measurements to the reference frame and datum needed for the results (see section 4 as well). 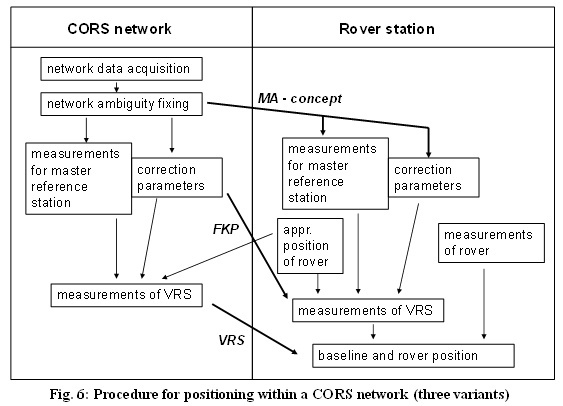 The abbreviations are chosen due to the information the rover receives from the CORS network; e.g. the transmission of the virtual reference station name the method to VRS. If we focus on PDGPS networks the accuracy as well as the promptness of the measurement is improved with respect to the respective simple PDGPS solution. The promptness is given in terms of “time to fix ambiguity” (TTFA) and the accuracy in terms of standard deviation. Seeber (2003) outlines that the use of network procedures increases the accuracy from 3 cm to better than 1 cm in the same time shorten the TTFA from 3 minutes to around one minute for a 30 km baseline. These numerical values are valid for mid latitudes. The gain will be even higher for equatorial or polar regions, where strong ionospheric gradients occur. But for these geographic locations the network has to be even denser than in the mid latitudes. In general one has to distinguish between CORS networks for post-processing applications and real time applications. The latter are more wide-spread in densely populated countries like e.g. Hong Kong (SatRef) or Germany; the latter country having three competing services (SAPOS, ASCOS and Trimble Now). For these coutries the real time network appoach described in 3.3 may be realised in post-processing via email or web-interface (Refer to Table 2) as well. Another possibility is to download the observation data of the CORS (reference station) in RINEX files or special compressed RINEX files and to process the data using software that is available to the respective user. This method is preferred, if highest accuracy should be reached. The RMS of the determined coordinates will be better by a factor of two to three with respect to the real time solutions. These services cover code and phase data. The quality of the results depends on the avialable software and the knowledge regarding GNSS processing. It is worth to mention that the International GNSS Service (IGS) provides RINEX data for stations all over the world. A third possibility especially for users that are non-GNNS experts are so called online-processing services. Here the user acquires data in the field, respectively for the stations that he likes to determine. The acquired raw data is then transformed into RINEX files and up loaded to the post-processing service. The latter is generally realised through a web-intreface or via email. The service provider will do the post-processing of the data together with the data of the reference stations that are at their disposal. After some minutes the positions will be provided to the user e.g. via email. Obviously the results of this service are not under control of the user, but on the other hand the results will use unique standards for processing and, most important, non-experienced users will get reliable coordinates only some hours or even minutes after the measurements have taken place. The majority of organisations involved with geo-science activity, management of geo-spatial datasets or infrastructure generally use a geodetic datum or at least some form of survey or mapping datum in their geo-referencing framework. The importance of using a datum or reference system to underpin their science, datasets or infrastructure allows the operator to effectively and efficiently collect, integrate, manipulate, analyse and store their positional data in a standard coordinate format. Issues can arise however when the subject data needs to be incorporated and used in another agency’s information system whose datum or reference system is not the same. The normal solution for this typical problem is to determine a set of mathematical transformation parameters or block shifts based on common points and then transform or adjust one dataset on to another. For small and localised datasets this type of solution will suffice, however with large and different types of datasets which could span over an entire local region or state or country or even continent, integration becomes more problematic and exaggerated, especially if there are several reference systems or datums involved, and the reference systems origins have been determined by a mix of space or classical geodesy. Complex transformation matrices could be determined and adjustments performed. However for datasets or infrastructure at a national level this is often a significant exercise. Typical examples for a complex but very accurate transformation using previously measured stations in both datum definitions and finite element method is developed and implemented by Jäger et al. (2003). As a consequence many countries or organizations use a sophisticated, and often simple and long term solution which is to migrate their positional datasets to a global terrestrial reference frame, in general ITRF. Fortunately many organisations or national survey agencies who are in the business of managing geo-spatial datasets / infrastructure or geo-science activity, have access to GNSS CORS infrastructure directly or through positioning service providers thus linking to ITRF should be a viable and practical option. For example Germany introduced ETRF89, a regional densification of the ITRF for Europe, as national reference system in 1995; at the same time implementing UTM-coordinates as two-dimensional projection coordinate system (ADV 2005). The long-term historic German geodetic datum was legally abolished and will disappear in practice within the following years. An ITRF based datum allows for a single standard for collecting, storing and using geographic or survey related data. This will ensure compatibility across various geographic, land and survey systems at the local, regional, national and global level. ITRF based GNSS CORS networks should form the basis for Spatial Data or Positioning Infrastructure which are the enabling infrastructures to manage a country’s fundamental spatial data sets. That is, it underpins or is the reference layer for the cadastre or land administration system, transit / road networks, infrastructure corridors like gas, water, power, communications etc. ITRF geodetic datums reduces the risk of confusion as GNSS, GIS and navigation systems become more widely used and integrated into business and recreational activities. ITRF based geospatial infrastructure through the contribution of relevant geodetic data (such as GNSS CORS observations) facilitates the resolution of regional or global issues in the scientific or social arena. For example - provide geodetic data for the development of a vertical reference frame to assist scientific research into climate change, sea level rise and tsunami warning systems; make possible accurate monitoring of plate tectonics and earth quakes; assist with the implementation of disaster management strategies; aid with the development of regional terrestrial reference frames or improvements to the ITRF. The adoption of ITRF strategies will transfer and develop or enhance the related skills, knowledge and experience during the implementation of the ITRF based geodetic datum thus building the capacity and setting the foundations for an organization as the market in the real time positioning services arena continues to rapidly grow. For a network select one station in the new network as the “master” or “reference” or “base”. At the master or the new stand-alone CORS log data (30 second or 1 minute rate is sufficient) for at least 24 hours, but ideally for up to 7 days. Download or acquire RINEX data from the closest IGS station or from the closest national CORS. Process the baseline from the IGS station, or from the national CORS, to the master using 24 hours of data. If data has been logged for several days, process the baseline for different 24-hour periods and take the mean. If possible, it is highly recommended to process additional baselines to the master from one or two supplementary IGS or national CORS. The final position or solution should be the mean of the results. If performed correctly, this basic procedure should provide very accurate ITRF coordinates for the master or the new stand-alone and link the subject CORS to the IGS or national CORS network. At all new CORS log data (30 second or 1 minute rate is sufficient) for at least 24 hours, or preferably for several days. Using the ITRF coordinates of the master as the reference point, process all the baselines of the network using 24 hours of data. If additional data has been collected then repeat for another one or two 24-hour periods. Adjust the network if adjustment software is available. If performed correctly, this basic procedure should provide ITRF coordinates for all new CORS in the network and have a high degree of relative accuracy. With respect to the determination of heights for the new CORS network or stand-alone CORS, the derived height will be based on the reference ellipsoid ie Geodetic Reference System 1980 (GRS80). Most organisations or users however are often working with or require their solution in physical heights based on a local height datum (such as local mean sea level) that has originated from a combination of levelling and gravimetric measurements. Consequently an empirical relationship or the undulation between the derived ellipsoidal heights to this local height datum needs to be known. This is achieved by determining or using an existing geoid model for the subject survey area or deriving a height transformation grid for the survey. You have to take the uncertainties of the geoid undulations into account, if you want to calculate the accuracy the transformed physical heights in the local datum. In situations whereby there are no existing ITRF based networks, and processing software is unavailable or not suitable, then there are also internet based online processing services which derive ITRF coordinates or positions, if sufficient RINEX data has been submitted for processing. These systems will provide a position solution based on an ITRF coordinate system by calculating baselines from nearby GNSS CORS having known ITRF co-ordinates. These reference stations could be located in another country and / or official IGS sites. There are some stations in a national CORS network that are of a higher order as they are the stations which define the national geospatial reference system and therefore are the link between the ITRF and the national refernce frame realisation. The remaining CORS in the network are normally for datum densification that facilates and supports important positioning services (such as a networked RTK service = real time CORS network), and other downstream applications. Essentially, all existing stations are streaming or collecting 24 hours of data for science, research or applications which require a certain level of quality, integrity and reliability thus it is vital that the stability of such infrastructure is monitored and subsequently modelled. Furthermore, as a manager of a GNSS CORS network it is crucial to have a regime in place that monitors and measures the CORS station involved are stable and that the defintion of the national geospatial reference system is stable. The fundamental method of monitering a CORS network is to implement a system that will compute coordinates for each CORS station at regular intervals (every day, every week, every month ...) automatically. Ideally the system should then compare the published ITRF values against observed, analyse the solutions, provide statistical information of the results and over time model the change or deformation. In some cases the resultant positions could be used to refine national geodetic networks or primary spatial datasets, such as the cadastre. As an example here we use the Swedish CORS network SWEPOS™. Currently the network consists of 175 stations. The defining stations in SWEREF 99, the swedish national reference system, are all well monumented permanent stations on bedrock. There are 21 SWEPOS-stations and additional stations in Finland, Denmark and Norway that partly also could be used for the definition of SWEREF 99. All SWEPOS-stations and some additional stations in neighbouring countries are in¬cluded in the daily/weekly processing of SWEPOS, which is the basis for the check of the used coordinates at the permanent stations. Each SWEPOS-station is deter¬mined in SWEREF 99 by a Helmert-fit to the closest defining stations and compared to the official used coordinates. Coordinates are up¬dated when found necessary due to equipment replacement or local station motions. The type and level of positioning services that a CORS network could implement or adopt will largely depend on the interest, possibility, resources available to the operators as well as the demand of the market. Some operators may also enter into such services so as to offset costs associated with maintaining this type of geodetic infrastructure that is used to perform their core geoscience business. Below you will find some examples of CORS networks from the Asia Pacific region as well as from European countries and web links that describe their services. Information on other CORS networks is available on the FIG Commission 5 webpage. SWEPOS is a national CORS network covering Sweden and run by the national mapping authority. The system consists of more than 170 stations where approximately 30 are of higher quality (mounted on bedrock and so on) and the rest are mounted on buildings. SWEPOS has several services and is used for positioning on the metre level down to scientific work on the sub-mm level (Norin et al., 2008). Since April 1st 2006, data for both GPS and GLONASS is provided in the RTCM standard format, version 3.0. The expected position accuracy is approximately 15 mm horizontally (68 %) and 25 mm vertically (68 %). Many of the users of SWEPOS Network RTK service do not belong to the conventional surveying community. This has resulted in the development of a field manual for network RTK measurements with the service which is distributed to all new users. The major Swedish GNSS equipment dealers also provide ready-to-go packages for the SWEPOS positioning services. These packages are tailor-made for different applications, and minimize the need for new users to master all aspects of their equipment in order to use the positioning services. A recent trend is the increasing use of the network RTK service for machine guidance and precision navigation, most notably in the form of flexible and redundant services that are tailor-made for large-scale projects. Download for post-processing is supported as well. In Germany three service providers have their own networks and offer products to the users: SAPOS run by the German state surveys, ASCOS is privately driven by the companies EADS and Allsat GmbH (together: AXIO-NET) and Trimble VRS Now of Trimble. All the three providers offer real time services on code and phase level as well as post-processing services. For further details the authors refer e.g. to Schenk (2009), Loef (2009) and Wegener (2009). For the web links is referred to SAPOS (2009), ASCOS (2009) and Trimble (2009). For German service providers SAPOS uses GSM and internet as well as the option radio transmission for communication. Positioning is realized in different accuracy steps from 1 to 2 cm (HEPS service) up to 0.5 m to 3 m (EPS service). The main RTK network concept is the use of area correction parameters (FKP), but VRS and MAC can be applied as well, if the respective rovers are in use. For further information is referred to SAPOS (2009). The Axio-net GmbH provides its ASCOS services via GSM and internet as well. Here VRS is the only RTK network concept (ASCOS 2009). The newest provider on the German market is Trimble pushing its Trimble VRS Now network as all-in-a-hand solution for surveyors and others. The technical specifications are more or less similar to the before mentioned service providers (Trimble 2009). SAPOS and AXIO-NET are offering download for post-processing applications as well. Malaysia Real Time Kinematic GPS network (MyRTKnet) has been established by The Department of Survey and Mapping Malaysia (JUPEM) and is a VRS network of permanent CORS. The Singapore Satellite Positioning Reference Network, SiReNT is a nation-wide reference network developed to support real-time high precision land surveying and other positioning applications. An initiative by Singapore Land Authority (SLA), SiReNT provides Differential GPS (DGPS) services which supports the latest technology of Network-RTK. The Hong Kong Survey and Mapping Office (SMO) of Lands Department has applied new technology to improve the quality of services in recent years. It makes use of the Global Positioning System, GPS technology of United States to develop a local satellite positioning system, namely "Hong Kong Satellite Positioning Reference Station Network" (SatRef). The National Geodetic Survey (NGS), an office of NOAA's National Ocean Service, coordinates a network of continuously operating reference stations (CORS). Each CORS site provides Global Navigation Satellite System (GNSS - GPS and GLONASS) carrier phase and code range measurements in support of 3-dimensional positioning activities throughout the United States and its territories. The Australian Regional GPS Network (ARGN) consists of a network of permanent geodetic quality GPS receivers, on geologically stable marks, in Australia and its Territories, with eight stations within Australia known as the Australian Fiducial Network (AFN). These sites provide the geodetic framework for the spatial data infrastructure in Australia and its territories. They also provide input for the measurement of earth processes, such as crustal dynamics and sea level rise. Data from the ARGN network also contributes to the International GPS Service. The Crustal Movement Observation Network of China, or CMONOC, is a network of large scale and high precision that covers over the whole China mainland with GPS as its main observation technique and combined with existing techniques of Space Geodesy such as VLBI and SLR, and combined with precise leveling and gravimetry. PositioNZ is Land Information New Zealand's Global Positioning System Active Control Network. Through this site you can download GPS 30 second RINEX files from the active control stations which you can use with remote GPS station data to determine precise positions in terms of New Zealand Geodetic Datum 2000. The Japanese Geographical Survey Institute has established about 1,200 GPS-based control stations throughout the country. Movement of the land of Japan is daily monitored by GPS Earth Observation Network System (GEONET). Observation data thus obtained are made available for actual survey works and for studies of earthquakes and volcanic activities. AdV (2005): Richtlinien für den einheitlichen Raumbezug des amtlichen Vermessungswesens in der Bundesrepublik Deutschland. ASCOS (2009): http://www.ascos.de. Last accessed august 2009.
International Association of Geodesy (IAG), last edited: 24. June 2009. IERS (2004): IERS Conventions 2003, IERS Technical Note No. 32 by D.D. McCarthy and G. Petit, Bundesamt für Kartographie, Frankfurt, 2004. ITRF (2009): Web-page of International Terrestrial Reference Frame (ITRF). http://itrf.ensg.ign.fr/ITRF_solutions/, last accessed July 2009. Jäger, R., Kälber, S., Schneid, S., Seiler, S. (2003): Precise Vertical Reference Surface Representation and Precise Transformation of Classical Networks to ETRS89 / ITRF - General Concepts and Realisation of Databases for GIS, GNSS and Navigation Applications in and outside Europe. Proceedings GNSS2003 – The European Navigation Conference, Graz, April 22-25, 2003. Kee, C (1996): Wide Area Differential GPS. In: Parkinson, Spilker (editors, 1996): Global Positioning System – Theory and Applications, Vol. 2, Chapter 3. Leica Geosystems, 2005. GPS Reference Stations and Networks – An Introductory Guide. Heerbrugg, Switzerland. Loef, P. (2009): ascos – one-stop-shop for precise satellite positioning services. In: GNSS 2009: Systeme, Dienste, Anwendungen. Beiträge zum 83. DVW-Seminar, 18.-19.03.2009, Dresden, Germany. Rizos, C. (2008) Multi-Constellation GNSS/ RNSS from the Perspective of High Accuracy Users in Australia, Journal of Spatial Sciences, Vol. 53, No.2, December, pp 29-63. SAPOS (2009): http://www.sapos.de. Last accessed august 2009. Schenk, A. (2009): SAPOS – Der amtliche Satellitenpositonierungsdienst. In: GNSS 2009: Systeme, Dienste, Anwendungen. Beiträge zum 83. DVW-Seminar, 18.-19.03.2009, Dresden, Germany. Seeber, G. (2003): Satellite Geodesy. 2nd Edition. Walter de Gruyter, Berlin. http://earth-info.nga.mil/GandG/publications/tr8350.2/tr8350_2.html, last accessed July 2009. 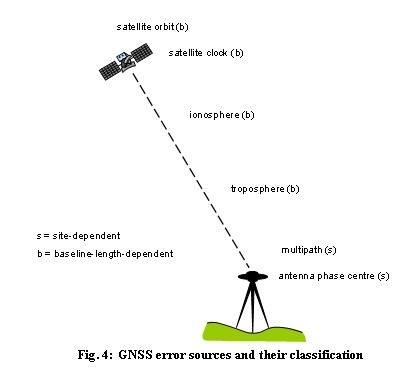 Norin, D., Jonsson, B, Wiklund, P. (2008): SWEPOS and its GNSS-based positioning services. Presented at the FIG Working Week, Stockholm, Sweden, 2008. Trimble (2009): http://global.trimble.com/de/. Last accessed August 2009. Wegener, V. (2009): Trimble VRS Now – RTK einfach nutzen. In: GNSS 2009: Systeme, Dienste, Anwendungen. Beiträge zum 83. DVW-Seminar, 18.-19.03.2009, Dresden, Germany. Wübbena, G., Willgalis, S. (2001): State Space Approach for Precise Real Time Positioning in GPS Reference Networks. Internat. Symp. on Kinematic Systems in Geodesy, Geomatics and Navigation (KIS2001), Banff, Kanada. Volker Schwieger obtained his Diplom-Engineer „Geodesy“from the University of Hannover in 1989. In 1998 he gets his Doctor Engineer at the University of Hannover as well and in 2004 he made his Habilitation at University Stuttgart. Since 2001 he has been a member of the research team at the Institute for Applications of Geodesy to Engineering at University Stuttgart, where he heads the metrology department since 2003. His research activities cover among others engineering geodesy, kinematic positioning, machine guidance and, of course, GNSS. He is also Vice Chair of FIG Commission 5 and head of FIG Working Group 5.4 “GNSS”. Robert Sarib, Manager, Survey Services in the Land Information Division of the Northern Territory Government’s Department of Planning and Infrastructure, Licensed Surveyor, member of the newly formed Surveying and Spatial Sciences Institute, and Vice Chair of Administration for FIG Commission 5 – Position and Measurement. Robert Sarib obtained his degree in Bachelor Applied Science – Survey and Mapping from Curtin University of Technology Western Australia in 1989. He was registered to practice as a Licensed Surveyor in the Northern Territory, Australia in 1991 and achieved this during his employment with the Northern Territory Government. Since then he has work in the private sector as a cadastral surveyor, and more recently re-employed by the Northern Territory Government to manage the Northern Territory Geospatial Reference System and administer the Survey Services work unit of the Office of the Surveyor General. He also holds a Graduate Certificate in Public Sector Management received from the Flinders University of South Australia. Mr Sarib is currently a member of the FIG Commission 5.2 Working Group – Reference Frame in Practice, and the Northern Territory delegate on the Australian Inter-governmental Committee on Survey and Mapping - Geodesy Technical Sub Committee. He is the Northern Territory representative on the interim board of the Surveying and Spatial Sciences Institute. He is also a board member of the Surveyors Board of Northern Territory for Licensed or Registered surveyors. Mr. Mikael Lilje graduated with a M.Sc. with emphasis on geodesy and photogrammetry from the Royal Institute of Technology (Stockholm, Sweden) in 1993. He has been working at Lantmäteriet (the Swedish mapping, cadastral and land registration authority) since 1994, mainly at the Geodetic Research Division. 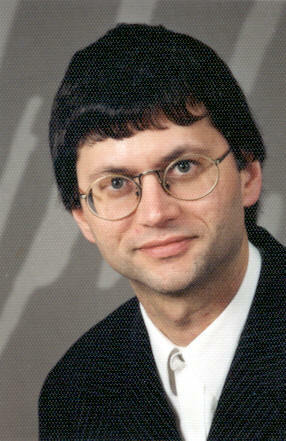 Since 2001, he is the head of the group Reference frames and coordinate systems. He is also incoming chair of FIG Commission 5 as well as chair of the FIG Working Group on “Reference Frames in Practice”.